Translink has said that a shutdown of a key piece of Northern Ireland’s train network is not likely to end until Friday morning. 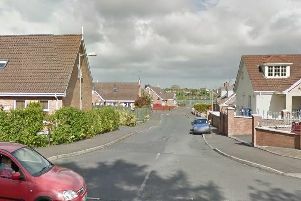 The incident has occurred aroud the Lisburn area, and photos taken from Knockmore Road – perhaps a mile to the west of the city’s train station – show the vehicle surrounded by staff, with no obvious external sign of damage. The train had struck what Translink described as a piece of “excavation equipment”. Asked if this was a digger or JCB-type vehicle, a spokeswoman said that while they could not give a precise description of the object, it was a “relatively small” piece of equipment. Translink said it was too early to say how the object came to be on the tracks. However, the police have said they do not suspect any criminal action such as a dissident republican attack. The train line is made up of two sets of tracks, and as of Thursday evening both were closed. This whole railway line connects Belfast to Lisburn, Lurgan, and Portadown, before heading south to Newry. The Dublin Enterprise service also runs along the route, and it was also hit be the disruption, with replacement bus services being put into action. An average of roughly 37,000 journeys are made on Tranlink’s rail network each day. Although other parts of the network such vas the Larne, Londonderry and Bangor lines were not shut, the closure of the Lisburn section – which unfolded after the incident occurred at about 6.45am – had knock-on effects upon other services. Seven passengers were on board the service at the time (plus the crew, which normally numbers three). Late on Thursday afternoon Translink said in a statement: ”Following an earlier incident where a train struck a piece of construction excavation equipment on the railway line south of Lisburn, the line will remain closed for the rest of the day. “A bus substitution will operate between Moira and Lisburn from now until 6.30pm to accommodate peak time commuter traffic. After 6.30pm the bus substitution will operate between Portadown and Lisburn. “A bus substitution will also continue to operate for cross border passengers between Belfast and Newry for the rest of the day. “Safety is our top priority and an investigation is currently on-going. “We are now taking steps to get the line cleared; our engineers have been on site and will be working throughout the night in order to get services back to normal for our customers. Translink said that the Health and Safety Executive (HSENI) were leading the investigation into the incident.